Definition of Totemism: What is Totemism? Totemism is belief in the kinship of a group of people with a common totem. The word totem is derived from the Ojibwe (Chippewa) word 'odoodem' meaning "his kinship group" signifying a blood relationship. Totemism was the practice of having a natural object or animate being, such as as a bird or animal, as the emblem of a family, clan, or tribe. Totemism encompassed a system of tribal organization according to totems. A totem was believed to be mystically related to the group and therefore not to be hunted. The totem adopted by a clan or family, most often an animal, is an object of religious veneration for the tribal community that bears the name of the totem refer to Animal Totems. The group’s members are therefore forbidden to hunt, kill, or eat the totem. Because of the family connections to the same totem, they are also forbidden to marry one another. Groups, clans or families that practise Totemism believe that the totem bestows and protects life’s blessings. Their conviction in their beliefs involves rituals and ceremonies intended to celebrate and honor the totem. The term 'Totemism' is often used to characterize specific traits in the social organisation and religion of different types of people. It applies to several Native American tribes located in the Pacific Northwest Coast of North America. The term 'Totemism' is most commonly applied to groups of hunter gatherers. Native American Totem Poles or totem posts are sculptures that are carved into large tress by cultures of the indigenous peoples of the Pacific Northwest Coast of North America that practise Totemism. 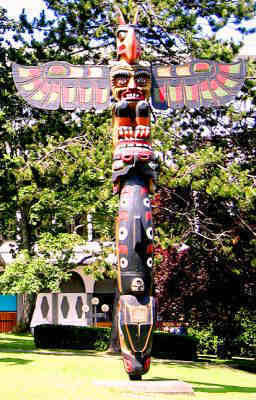 Totem poles were erected in the front of a Native Indian's home and would show the ancestry and the social rank of the family. The figures carved on the Totem poles might be humans, animals, or other creatures and might also display mythological and legendary images, usually Animal Spirits, whose significance was their association with the lineage of the tribe. Each figure carved on a Totem Pole represented a type of family crest or family legend in the form of pictographs that were particularly relevant to Totemism. At this point it should be emphasised that Totem Poles were not worshipped within the belief of Totemism. Totem poles were made to fill a variety of needs, but their primary purposes were to commemorate specific people or special events. Authentic totem poles were carved by special carvers who follow the old rules of traditional symbols, legends, stories and family crests. 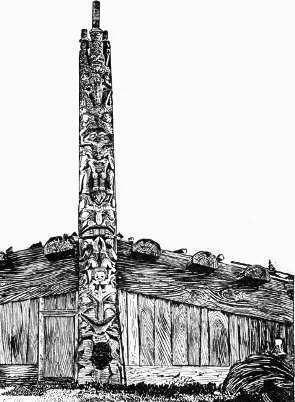 The decision and design to create a Totem Pole and the raising of a completed Totem Pole was accompanied by rituals such as the Potlatch ceremony, Totem Pole Raising ceremonies, funeral ceremonies and Spiritual Healing ceremonies. The concepts of Totemism, Animism, Ritualism and Shamanism should all be considered to gain a full understanding of the religious beliefs of the Native American tribes who practised Totemism. Children always take the name of the mother. If a Bear man married a beaver woman then all the children would be beavers, who would be their totem animal. Every one believes that the animal that is his totem can help him, and he pays it great respect. Discover the vast selection of pictures which relate to the History of Native Americans and illustrate many decorations and tattoos used by American Indians. The pictures show the clothing, tattoos, war paint, weapons and decorations of various Native Indian tribes that can be used as a really useful educational history resource for kids and children of all ages and a means to study their interpretation. We have included pictures to accompany the main topic of this section - Native American Culture. The videos enable fast access to the images, paintings and pictures together with information and many historical facts. All of the articles can be accessed via the Native Indian Tribes Index.